To U.S. officials, he is the secretive mastermind behind a company that is extending the Chinese government’s ability to infiltrate computer systems and data networks around the world. In his first public comments since U.S. authorities arranged for the arrest of his daughter Meng Wanzhou, who is also Huawei’s chief financial officer, Ren told a group of reporters last week that he missed his daughter very much, and that he would wait to see if President Donald Trump intervened in her case. He called Trump a “great president,” and said that his tax cuts had helped American business. Meng was arrested in Canada last month on accusations of defrauding banks to help Huawei’s business in Iran. Washington, D.C., is seeking her extradition, but Trump has suggested that he might intercede if it would help China and the United States reach a deal to end their trade war. Huawei has said that it is unaware of any wrongdoing by Meng. Ren’s comments also came less than a week after Polish authorities said that they had arrested a Huawei employee there on charges of spying for Beijing. The company fired the man Saturday. Ren insisted that his company has not spied for China. “I love my country. I support the Communist Party. But I will never do anything to harm any country in the world,” Ren said on Tuesday. Huawei has 180,000 employees and has become the world’s largest maker of telecommunications equipment. It estimates that it generated more than $100 billion in sales last year, and it sells more smartphones around the world than Apple. Yet Ren seldom appears in public. 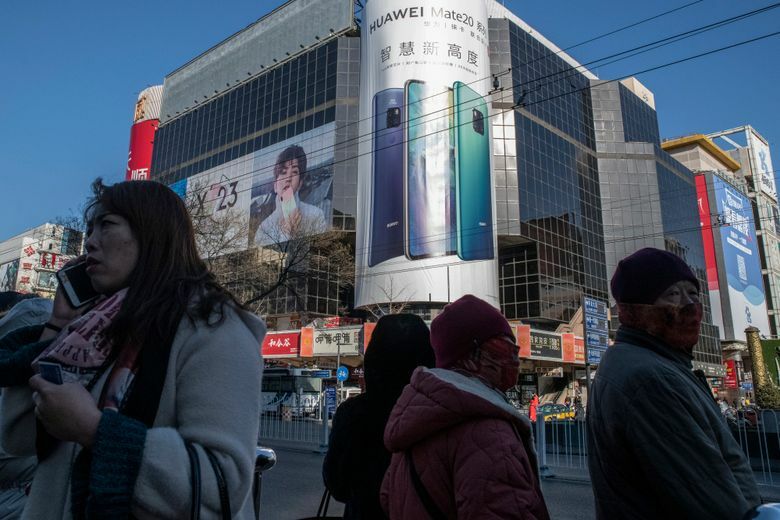 When he has spoken to the news media in the past, he has played down his achievements, attributing Huawei’s success to its employees’ hard work. He has said that his company has never spied for any government — an assertion that has not eased the concerns of U.S. counterintelligence officials. It was founded in 1987, but it did not begin publishing the names and biographies of its board members until its 2010 annual report. Ren spoke to the news media for the first time in 2013. The following year, he told The Independent of London that he had no hobbies, prompting a colleague to lean in and suggest that he enjoyed reading and drinking tea. Ren was born in 1944, in the mountainous southwestern province of Guizhou. His parents were teachers; he was one of seven children. His father, Ren Moxun, was the son of a master ham maker in Zhejiang province. Growing up, Ren wrote in a 2001 article, the family was so poor that he did not own a proper shirt until after high school. The infrastructure engineering corps was disbanded in 1983, according to the official biography. A few years later, Ren and business partners founded Huawei in what he called, in a 2016 interview with the official news agency Xinhua, a “rundown shack.” The company started as a reseller of telephone equipment imported from Hong Kong, but later started developing its own technology. Ren has a reputation for being blunt in conversation. In 2010, Rick Perry, then the governor of Texas, spoke at the ribbon-cutting for Huawei’s new U.S. headquarters in Plano. “If you didn’t know any better, you’d say he grew up out in West Texas,” Perry, who is now Trump’s energy secretary, said, according to a video of the event posted online by the governor’s office. That penchant for brutal honesty has not spared the members of Ren’s family who also have worked for Huawei: Meng and her husband, plus two of Ren’s siblings. For a long time, people in the telecom industry speculated about whether Ren would pick one of these relatives to lead the company after his death. But in a 2013 letter to employees that was shared on a company website, Ren said that his successor needed to have vision, good character and a deep understanding of both new technologies and customers’ needs. Ren’s plain speaking has not managed to make U.S. officials feel comfortable about allowing Huawei’s gear into the country’s internet infrastructure. According to a diplomatic cable published by WikiLeaks, Ren told the U.S. consul general in Guangzhou in 2008 that if Huawei really had ties to Beijing, the company would be in real estate, not telecom equipment. That, he said, was where the easy money was. Career: Studied engineering in college, then joined the Chinese military’s infrastructure engineering corps in 1974. Founded Huawei in 1987 to resell telephone equipment imported from Hong Kong. Public presence: Spoke to the news media for the first time in 2013.